Born in Naples on 17 September 1817, Carlo d'Apice was the only child of Antonio d'Apice (c.1781-1857), said to have been an officer in the Bourbon royal service at Caserta, and Clementine Maria Sica (1801-1884). Apparently, his childhood home was in apartments in one of the royal houses of Ferdinand of the Two Sicilies at the Villa Floridiana, at Vomero. He was educated in Naples, and later trained at the Conservatorio di San Sebastiano, where he (like Vincenzo Bellini before him) enjoyed the patronage of one of its three governors, Giovanni (Giambattista) Carafa (1773-1849), duca di Noja, who was a cousin of his mother. He was encouraged to move to Paris with Carafa's support and a small inheritance, and he formed close friendships with Carafa's daughters, Giulia (b. 1820, who later succeeded to her father's title), Livia (1825-1901, ducessa di Bojano), Carolina (b. 1829), and Maria (b. 1841). It seemed to me when seated near the piano that I was in Paris, in my old place close to Liszt, in Erard's concert room, in 1845. Never since those days of brilliant artists, Thalberg, Prudent, &c, have I heard the piano move to such wonderful music . . . His playing invites for me a chain of distant souvenirs. I hear at the same moment the marvellous execution of Liszt, and the exquisite pathos of the voice of Rubini, the king of tenors, who always moved his audience to tears. To this double charm Mr. Ketten unites in his pianissimo passages on indescribable delicacy of touch which I thought never again to hear, and which reminds me of my old master Chopin . . .
What sort of other contact, if any, he indeed had with any of these artists - most notably "my old master Chopin" - remains a matter of conjecture. Meanwhile, what little else we can know for sure about his public career and circle must be gleaned from concert reviews of his performances and his published musical compositions. In Paris, he was published under the imprints of Pacini and Chabal, and his works bear dedications, beside his Carafa and Thomas relatives (Livia Carafa married Luigi Thomas), to minor society figures, all women. None of the printed editions of his compositions are dated, though those few with opus numbers might give some shape to a tentative chronology. Otherwise, it perhaps seems that the Pacini editions predated those of Chabal. His polka compositions probably date from no earlier than the height of the Parisian polka craze (c.1843), and deriving from the Paris original edition, there is a single American edition of his Vittoria polka. Later yet another version of this work was also published in Naples. Later in Australia he collectively dated his own bound album of his Paris editions "1845", though some of the prints are probably slightly earlier and later. However, there is no record of any new compositions by him appearing in Paris after the 1840s. 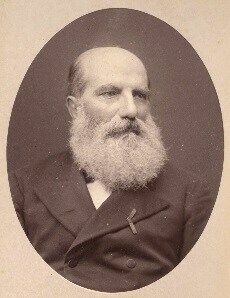 In 1853, he received a papal knighthood from Pius IX (Giovanni Mastai-Ferretti), on account of which he was later in Australia often referred to as Chevalier d'Apice. According to family tradition, he had assisted the papal states by acting as a courier. Again according to tradition, he later made some unfortunate investment decisions, prompting his then fiancée, an American heiress, the otherwise unidentified Miss Strather (? or Strother) to break off their engagement (a portrait of "Miss Strather, of Louisville, Kentucky, c.1851" is listed in the catalogue raisonne of society painter Franz Xaver Winterhalter). He unsuccessfully attempted suicide by shooting himself, then left Paris for Suez, where, literally nursing his wounds, he briefly worked for his friend Ferdinand de Lesseps (1805-1894) in the administration of the canal project. On 27 April 1859, he embarked from Suez on the Northam, which docked at Sydney on 12 June 1859. He travelled under the name "Charles d'Apice", which he henceforth used exclusively in Australia. 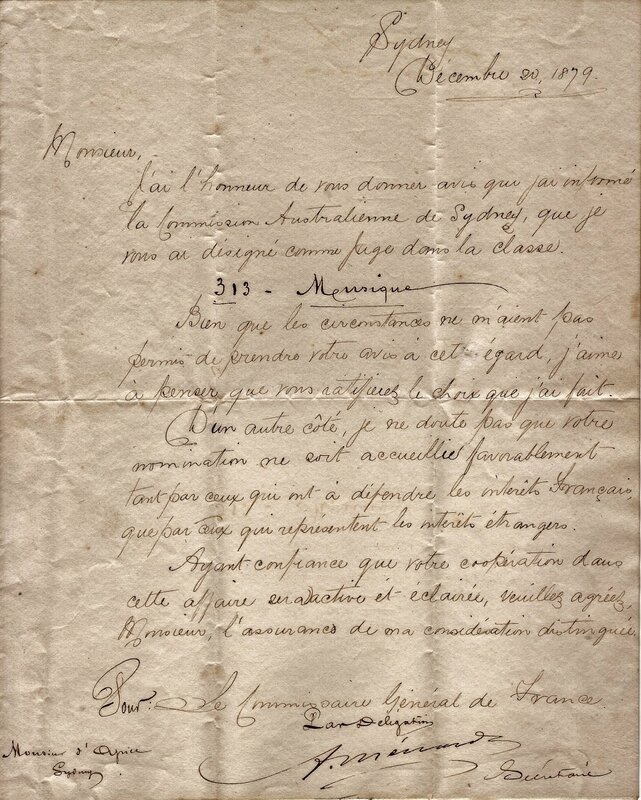 He received an encouraging welcome from the French consul, Loius Sentis, at his residence at Hunters Hill, and from the French priests at the nearby Villa Maria. He settled first at 4 Marlborough Street, Surry Hills, where he began to take music pupils, and later in Castlereagh Street in the city. But he was soon drawn back to Hunters Hill, where he purchased a house on the Lane Cove River called "Grand Cailloux", from the developer Jules Joubert, and renamed it Villa Floridiana after his childhood home. He was naturalised a British subject on 16 January 1861. In February 1862 a malicious advertisement in the Melbourne press, wrongly accusing him of having left behind a wife and children in Europe, was clearly intended to disrupt his plans to marry Mary Madeline White, daughter of retired Bathurst publicans (and prominent Catholics) Patrick White and Anne Kinchela. The couple married, nevertheless, and lived thereafter among the French Catholic settlers at Hunters Hill. Charles reportedly never mastered conversational English, and he and his wife and their large family spoke French at home. In the 1880s he taught music at several private schools, including notably, from 1881 to 1883, at St. Ignatius's College, Riverview. He returned to Europe twice, first in 1882, and again in 1884. Though he suffered hearing loss, he continued to teach up until the month of his death. He died at home in Hunters Hill on 5 July 1888 and was buried in the churchyard at St. Charles's, Ryde, where his headstone can still be seen. From 1891 to 1897, with help from her daughters, his widow, as Madame d'Apice, operated a ladies' school from the family home. She died there on 10 January 1911. Marsiglia. - Tutti quei gironali parlano assai favorevolmente del giovine maestro ed allievo del nostro reale Conservatorio di musica Carlo Sica - Egli in un concerto di piano-forte al Gran Teatro si à fatto grandissimo onore ed i Marsigliesi applaudendolo e festeggiandolo, lo chiamano un artista di merito, a cui non manca nè genio, nè eleganza, nè arditezza.
. . . - Le concert de MM. Collignon et Wartel où ce'dernier a chanté avec le goût et le sentiment qui le caractérisent deux lieders de Schubert dont il s'est fait l'apôtre. Puis enfin la matinée musicale de M. Carlo Sica, où chantait la troup italienne, et dans laquelle le beneficiaire e exécuté sur le piano un nocturne de sa composition qu'on e trouvé trop court, ce qui n'était pas encore arrivé à un nocturne. TÉOPHILE GAUTIER. PER GENOVA - John Broadhurst . . . J. W. Van Hoogstraten, capitano - Carlo Sica, maestro di musica . . .
M. Carlo Sica, pianiste compositeur très recherché dans le grand monde, donnera un concert le 11, chez M. Pleyel, avec le concours de nos artistes les plus distingués. Un des derniers et un des plus brillans concerts de la saison a été donné hier par M. Carlo Sica, jeune pianiste napolitain qui prendra bientôt rang parmi nos plus célères virtuoses. On a beaucoup applaudi une romance de la composition de M. Bazzoni, et deux morceaux brillans dans lesquels le beneficiaire a fait preuve d'un vrai talent de vituose et de compositeur. On a surtout applaudi le morceau intitulé: Souvenirs de Naples. 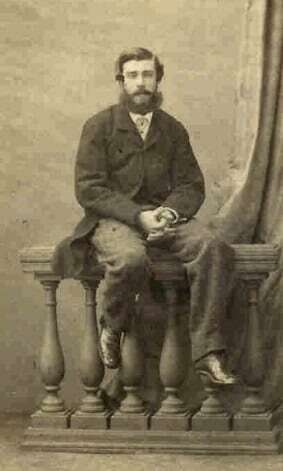 Carlo Sica. La Caroline, polka pour piano-forté . . . 3-0; Chez Pacini, boulevart Poissonnière. [Advertisement], Journal des demoiselles 25-5 (November 1855), unpag. ARRIVALS - JUNE 10. NORTHAM, P. and O. Company's steamer, 1600 tons, Captain Stead, from Suez, 28th April, Aden 4th May, Mauritius 16th May, King George's Sound 1st, Kangaroo Island 5th, and Melbourne 7th instant. Passengers: From Suez - . . . Mr. C. D. Apice [sic] . . .
Patron: His Excellency the GOVERNOR-GENERAL. AT THE GREAT HALL OF THE SYDNEY EXCHANGE. MONDAY EVENING, December 10, 1859. Doors will be open at half-past Seven, to commence at Eight o'clock precisely. 4. Aria "Revenge Timotheus Cries." Alexander's Feast. Handel.... Amateur, Mr. Waller. 2. Une Reverie, et une Fantaisie sur trois airs Napolitains. Pianoforte . . . Signor CHARLES D'APICE. 3. Quartette vocal - A te Ocara, from Il Puritani ... Rossini. 4. Glee - "Huntsman's Song" ... Pohlenz. 5. Overture - " Othello" ... Rossini. SYDNEY PHILHARMONIC SOCIETY. - The fourth concert of the season came off last night, in the hall of the Exchange, when, despite attractions of an intellectual character elsewhere, the building was filled by a very respectable auditory. The programme on this occasion embraced selections from Auber, Mozart, Rossini, Bellini, and Weber. The finest performance vocally was by Mr. Black, who, in the absence of Mr. Waller, sang "The heart by woe o'ertaken," from the opera of Maritana. Mr. Black has an excellent and powerful voice, is a good musician, and sings with expression and animation. The opening piece, the overture to Massaniello, by the full orchestra, was very well performed - it is a grand and sounding piece of music, full of fine contrasts, the harmony now marching on in a magnificent volume, and anon, the many voiced instruments blending together in most subdued melody. 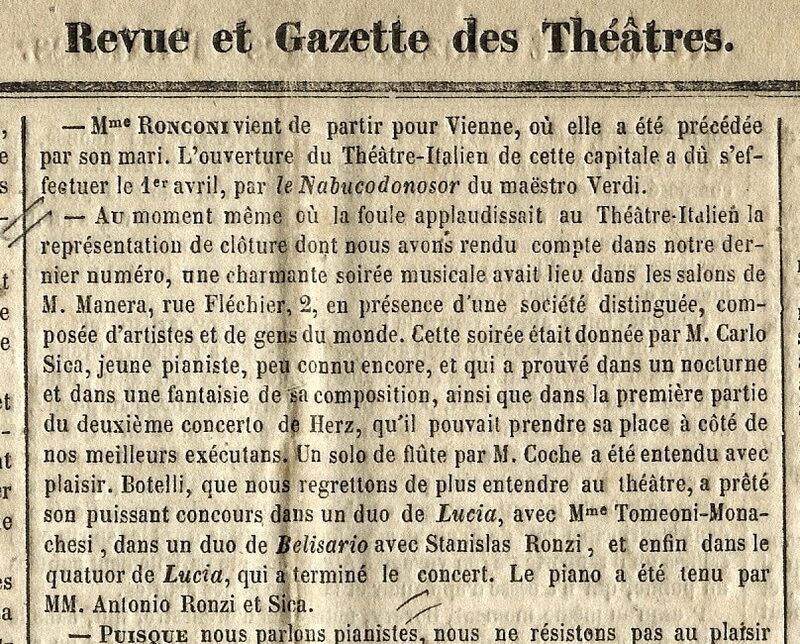 The concert was rendered somewhat memorable by the first appearance in this city of Signor Charles D'Apice, who played on the pianoforte what was termed in the programme "Une Reverie et un Fantasie sur trois airs Napolitains." Signor D'Apice is a good player - has expression and sentiment, and is evidently a cultivated musician. He had the honour of being encored, the only compliment of the kind paid during the evening. The instrumental quartette, "God Save the Queen," by Onslow, was rendered in a praiseworthy manner, whilst in the vocal quartette, we only regretted that Miss Brady had so little to do. The concert, upon the whole, was successful, and the gentlemen who rendered such valuable assistance are worthy of all encouragement. CHARLES D'APICE, Professor of the Pianoforte and Singing, 122, Castlereagh-street. PERSONS ADVERTISED FOR. - D'APICE, alias SICA, SIGNOR, Professor of Music, formerly of Naples. - Your wife and two daughters just arrived safely, but in very delicate health, from London. Pray do write without delay. Address General Post Office, Melbourne. PERSONS ADVERTISED FOR. - Referring to the advertisement under the above heading, inserted in the issue of the SYDNEY MORNING HERALD of the 25th January instant, addressed to "D'Apice, alias Sica Signor, Professor of Music, formerly of Naples," stating "that his wife and two daughters had arrived at Melbourne," I can only say that I have sever been married, and that the advertisement is a false and malicious libel. CHARLES D'APICE. Villa Floridiana, Hunter's Hill, 25th January. PERSONS ADVERTISED FOR. Re D'APICE. The following has been handed to us for publication. (Signed) FAIRFAX and SONS. 3rd March, 1862. Detective Office, Sydney, 26th February, 1862. For the information of the friends of Mr. D'APICE, I beg to state that enquiries have been instituted at Melbourne by the detective police there, and advertisements have been published six times in the Melbourne Argus and Herald, of which the following is a copy: "Persons advertised for. - An advertisement having appeared in the Sydney Morning Herald of 25th January, 1862, addressed D'Apice alias Sica Signor, professor of music, formerly of Naples, stating that his wife and two daughters had arrived from London at Melbourne; if such persons have arrived, they are requested at once to communicate with the Superintendent of Detective Police at Melbourne." (Signed) C. H. NICOLSON, "Superintendent of Detectives." By the report of Mr. Nicolson, no answer has been given to these advertisements; no such persons have come forward or have in fact arrived, although every effort has been made to discover them if in Melbourne. CHARLES G. HARRISON, Inspector of Detective Police, Sydney. MARRIAGES. D'APICE - WHITE - On Wednesday, the 23rd April, at St. Mary's Cathedral, by the Very Rev. J. Keating, V.G., assisted by the Rev. J. Sheridan, the Chevalier Charles D'Apice, son of the late Antonio D'Apice, Esq., of Naples, to Mary, eldest daughter of the late Patrick White, Esq., of Bathurst.
. . . Not long since the proprietors of the Sydney Morning Herald had felt it their duty to offer a large reward for the discovery of the author of some advertisements reflecting on the character of one Chevalier D'Apice, and there were other cases in which similar persecution had taken place . . . THE undersigned can dispose of a few hours twice a week for Tuition in Pianoforte, and Singing. CHARLES D'APICE, Villa Floridiana, Hunter's Hill. MUSIC - Signor d'APICE attends twice a week at Mrs. Cowper's, 364, Liverpool-st., Darlinghurst. PIANOFORTE and Singing Lessons. - Signor Charles d'Apice. Duties resumed Jan. 15. 335, George-st.
PIANOFORTE and Singing. - Signor d'APICE'S duties resumed January 15. W. H. Paling, 356, George-st. The recitals yesterday were numerous, and, unfortunately, they were so nearly at the same hour that hearing them all was a matter of difficulty. Two at the orchestral platform were announced for 3 o'clock, and one in the French Court for a quarter-past 3; Mdme. Summerhayes goodnaturedly began before the time and shortened her fifty-sixth recital, of which we confess to have heard very little; but from previous knowledge and the remarks of the audience, we are prepared to endorse their verdict that the performance was "very good." In the French Court, a lady amateur, a pupil of Signor D'Apice played on Erard's full Concert Grand, exhibited by Messrs. Paling. The programme contained a Caprice, by Ketterer; "Rigoletto," Madame Oury; a Fantasia, by Thalberg, and a "Souvenir on three Neapolitan Airs," arranged by Signor d'Apice, and played by the pupil with considerable skill and intelligence. "The following judges have been nominated: . . .
Department 3, Education. - Class 313 [music]: Messrs. Mehlan [recte Meilhan], Stretschmann [recte Kretschmann], d'Apice, Hon. George Thornton, Messrs. [Montague] Younger, Blackett, Jackson, and [Charles] Packer . . .
HENRY KETTEN. To the Editor. Sir, - Having received the annexed communication from so well known an artist as the Chevalier D'Apice, I should feel obliged if you would, in justice to the writer and visitor, afford it a place in your columns. - I am, sir, yours, &c., W. H. PALING. 352, George-street, May 18. "Villa Floridiana, Hunter's Hill," May 15, 1880. Dear Sir, - Whilst every musician cannot fail to be indebted to you for the delightful evening's entertainment you afforded them on Thursday last by the introduction to us of the pianist, Henry Ketten, I feel impelled to convey to you the impression I felt on hearing the extraordinary performance of this truly wonderful artist. It seemed to me when seated near the piano that I was in Paris, in my old place close to Liszt, in Erard's concert room, in 1845. Never since those days of brilliant artists, Thalberg, Prudent, &c, have I heard the piano move to such wonderful music. Talent is not the word to use in speaking of M. Ketten. Genius is the only expression, or rather I feel inclined to say that he himself is music. His mastery of the mechanism of the instrument surpasses everything I have seen, but even that is thrown into the shade by the wonderfully musical tone which passes from his fingers to the piano making each note, not merely a note perfectly played, but a volume of rich sound. As for his crescendo, nothing in my long experience has equalled it. His playing invites for me a chain of distant souvenirs. I hear at the same moment the marvellous execution of Liszt, and the exquisite pathos of the voice of Rubini, the king of tenors, who always moved his audience to tears. To this double charm Mr. Ketten unites in his pianissimo passages on indescribable delicacy of touch which I thought never again to hear, and which reminds me of my old master Chopin. His preludes, too, when after a few strokes he leaves on the piano one sweet lingering sound, which, gradually dying away, gives the key to the coming melody. I fear that, I have made my note long, but it is not every day that one has to speak of genius. It would take a much longer letter to express half the pleasure I experienced. For the love which I bear to music, I trust that the musical students of Sydney will profit by the opportunity of hearing its highest expressions. I will earnestly recommend my own pupils to do so. The proceedings in connection with Mr. Ketten's leave-taking on Saturday night were of a novel, and let me whisper, slightly theatrical, and that of the sensational character, especially that of the laurel wreath presentation. Signor D'Apice evidently acted on the impulse of the moment, for I can scarcely imagine a gentleman would venture on the platform with the intention of crowning another with laurel, and finishing the performance by an embrace! Mr. Ketten seemed totally unprepared for either of the notions, and for a few moments the bewildered expression of his countenance implied that he was in expectation of something about to happen, even more startling. The wreath, which is a triumph of the jeweller's art, did not add greatly to the musician's personal appearance, and I thought it a great improvement when the ornament was removed . . .
PIANOFORTE and SINGING - Signor D'APICE resumes duties July 12. He can now dispose of Mondays and Thursdays (the days of Belmore College, recently closed). Early application necessary, W. H. Paling, 352, George-street. WRENTMORE COLLEGE, SOUTH KINGSTON. The Misses COOKE. - English, Mr. Fache; Mathematics, Mr. Whitfield; French, Monsieur Lalchère; Music, Signor D'Apice and Governesses; Drawing, Miss Felton; Dancing, Mr. Needs; Calisthenics, Sergeant Lees. Pupils prepared for the Senior and Junior Examinations.
. . . Before the prizes were distributed the students, in order to show their musical and elocutionary talent, rendered a number of instrumental and vocal selections, choruses, and recitations. The entertainment - a delightful one it was too - was carried out under the direction of the Very Rev. Rector, Rev. J. Ryan, S.J., Rev. T. Gartlan, S.J., Rev. M. Harrington, S.J., Herr Hugo Alpen, singing master, Signor D'Apice, professor of music, Mr. Hermes, bandmaster, Mons. Jules, and Mr. S. Murphy. 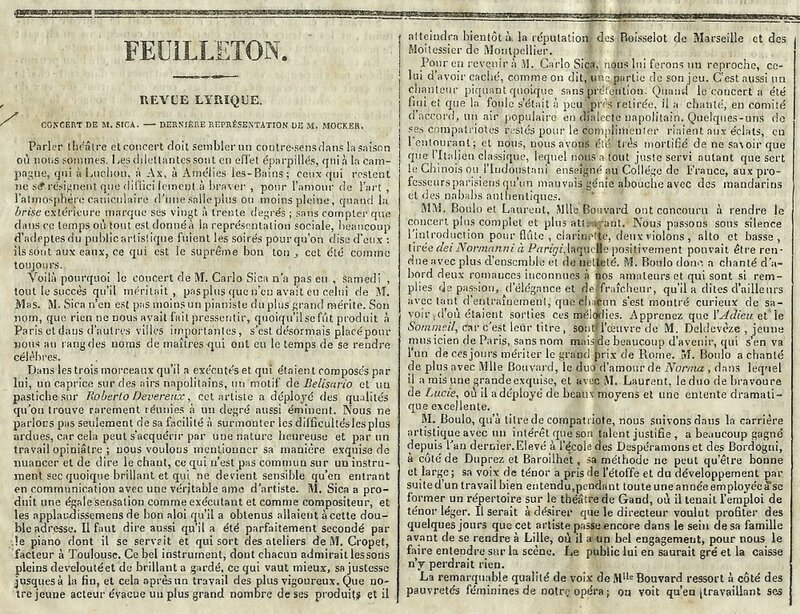 Those who had the arranging of the programme entrusted to them showed most excellent taste in their selections, and it is a noteworthy fact that there was not one failure in the whole entertainment - every number was more or less meritorious, and the applause bestowed by the audience was fairly carried. Of the vocal musical selections the best in our opinion were "Silver Chimes," by F. Donovan, and the song from "L'Exilire d'Amore" [sic] by T. Kelly, and the best of the really fine choruses sung by the pupils was "Pull all together, Boys," which was given with great vigour. The college band acquitted itself creditably in the march from "Norma" and "Les Roses," and the duet for clarionette and cornet, by J. Ireland and F. Souter, was a most praiseworthy effort, the latter performer, in particular, displaying rare skill . . .
PIANOFORTE & SINGING. Miss Nealds, ST. KATHARINE'S, WINDSOR. Reference kindly permitted to Herr Kretschman and Signor D'Apice. Miss NEALDS will visit Richmond twice a-week. 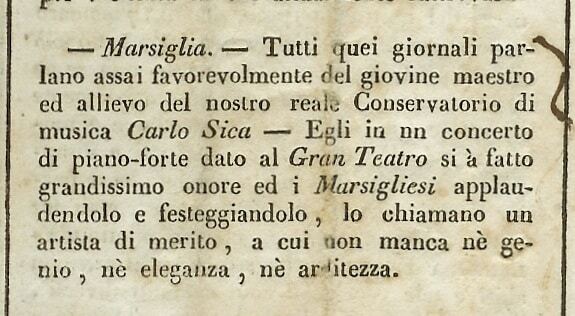 SIGNOR D'APICE begs to inform his Pupils that he intends visiting Europe for twelve months, leaving on May 12th, and will resume his musical tuition in June, 1883. Villa Florldiana, Hunter's Hill. DEC 21. Chimborazo, SS. (Orient Line) 3,817 tons, J. F. Ruthven R. N. R., commander, from London via Plymouth 6th ult, Naples 13th ult, Port Said 18th ult, Suez 20th ult, Aden 27th ult, and Diego Garcia 5th inst. Passengers - Saloon: For Melbourne - Baroness Von Donop and servant, Right Rev. Dr. Murphy, Bishop of Hobart, Very Rev. Dean Beechinor . . . For Sydney: Mr. and Mrs. O. M. de Lepervanche, Misses Lepervanche (2), Mr. and Mrs. A. Paterson and child, Mrs. Vosper, Rev. M. Walsh, Chevalier C. D'Apice . . .
. . . Reports have reached here as to the dangerous state of the health of Mr. Henry Ketten. From Signor D'Apice, who has just returned from Europe, we learn that the great pianist has had a very serious illness, has recovered so far as to take part as judge in the examination of pupils at the Conservatoire de Paris, and after playing at the Pasdeloup concerts is to start on a tour through Russia, whither Rubinstein himself is anxious to welcome his brother artist . . .
CAMBRIDGE-STREET, South Kingston. - WRENTMORE COLLEGE. Principals, the Misses COOKE. In addition to governesses, the following professors attend: C. J. Fache, English and mathematics; Dr. Roth, science lecturer, director of physical education; music, Signor d'Apice; singing, Signor Steffani; drawing, Miss Felton. School reopens July 16. Melbourne (s.), 4000 tone, Captain R. Minter, for Marseilles, via Melbourne and Adelaide. Passengers - for Marseilles: Mr. and Mrs. H. Gardin, Messrs. Chas D'Apice, E. Michel, Wallart, J. Ballan, and H. Wilson . . .
BURWOOD, KENT HOUSE. - Tuition for the Second Quarter will (D.V.) be resumed on MONDAY, April 13. Miss LESTER receives a very limited number of Boarders in connection with the Day-school. In addition to Resident Teachers the following Professors will attend: Mr. Fraser (of Trin. Col., Cam. ): English, Latin, and Mathematics. Madame Boivin (from Paris): French. Signor d'Apice: Music. Mrs. Thompson (recently from England): Music and Singing. Dr. Roth: Calisthenics and Physiology. Messrs. Needs: Dancing. N.B. - Non-pupils are at liberty to join Professors' Classes. SIGNOR D'APICE resumes his Pianoforte Lessons to advanced pupils July 11. Drummoyne-st., Hunter's Hill. D'APICE. - July 5, at Villa Floridiana, Hunter's Hill, Charles d'Apice, aged 71. In the will and codicil of Charles Fransisco Luigi d'Apice, late of Villa Floridiana, Hunter's Hill, near Sydney, in the Colony of New South Wales, gentleman, deceased . . .
. . . a professor of music from Naples, lived with his family in Villa Floridiana.
 . . . For the most part they [the laymasters in the early 1880s] were a seedy lot, sometimes talented but mercurial, often eccentric and incompetent, rarely cast in the mould of good schoolmen. 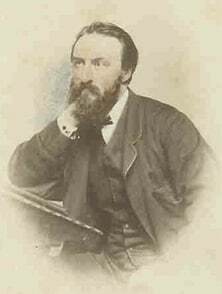 In the earliest years only three-Jules Czetwertinski, Carlo Luigi d'Apice, and W. J. Therry-remained long enough to make any kind of mark, and d'Apice was necessarily limited by the fact that he was music master, responsible only for giving tuition in the piano and singing to those who wanted it. His presence nevertheless enhanced the environment of the school as he had been a concert pianist of some renown in Europe and, in a quite different capacity, enjoyed the rank of Chevalier of the Order of the Golden Spur, bestowed on him by a grateful Pope Pius IX for whom, in the disguise of a woodman, he had carried secret despatches in his shoe during the siege of Rome in 1848. Owner bound album of sheet music (Sydney, d'Apice family), cover label: "MUSIC BY / CHARLES D'APICE SICA. / 1845. "; binder's label: "Bound by D. Roberts, 284, Pitt St., Sydney" (David Roberts, bookseller and bookbinder, at that address 1858-73); top right of the first print inscribed "Pour ma trés chère Livia. Villa Floridiana Hunters Hill Dec:ber 1883 Charles d'Apice". Preserved between the bound leaves, is a manuscript song La Plainte de l'âme! dedicated to the "duchesse de Bojano" and addressed to Livia's daughter Jeanne de Bojano, dated at Paris 14 April 1884 during one of Charles's two return trips to Europe. 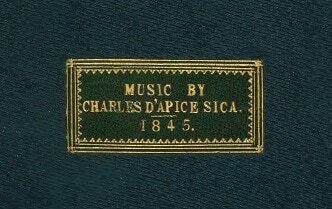 Charles d'Apice probably had the album bound in the 1860s, long before he gave it to his daughter Livia, on her 18th birthday on 16 December 1884). His third child and first daughter Livia (1866-1962) was named after his Neapolitan relative, Livia Carafa Thomas, ducessa di Bojano. Livia Carafa (b. 1825) was herself dedicatee of the eponymous Livia, and, much later, of the manuscript song La plainte de l'âme, romance, d'Apice's last surviving work, and the only surviving composition post-dating the 1840s. Livia's younger sister Carolina was likewise dedicatee of La Carolina, and their mother Vittoria Carafa, of Vittoria. Two other prints in the ablum are dedicated to otherwise yet to be identified members of the Thomas family (Livia married Luigi Thomas). Copy at Madrid, Biblioteca Nacional; from the music collection of concert pianist Juan Maria Guelbenzu (1819-1886), inscribed: "À mon cher ami Guelbenzu, Carlo Sica". 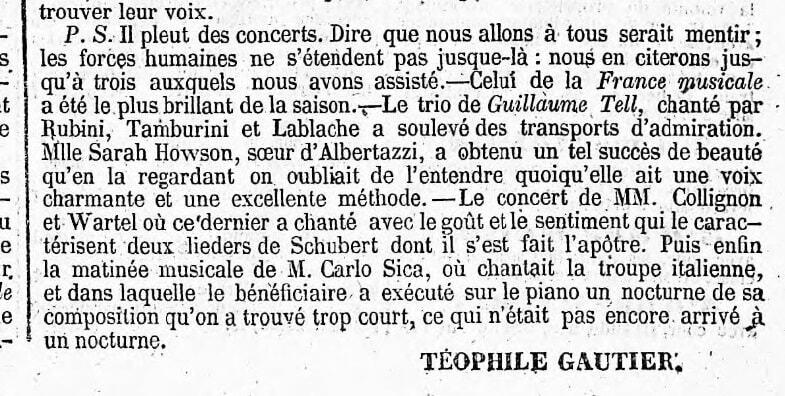 Guelbenzu was in Paris, where he met Chopin, Thalberg, and Liszt, until 1841, when he returned to Spain to take up the post of organist in the royal chapel. The chief difference between the two versions is that in A, probably the earlier, a prelude (absent in B) precedes the introduction. The dedicatee was the daughter of Zélie de Coussy, herself a singing pupil of Marco Bordogni and close friend of Donizetti and dedicatee of Don Pasquale. Isaure de Coussy had been a piano pupil of Frederic Kalkbrenner in 1837. The dedicatee was Vittoria Carafa, mother of Livia and Caroline. (Paris: Chez Pacini Editeur, Boulevard des Italiens, No. 11, n.d. ); publisher's number "394"; engraver, Renard; stamped, "1845"
Dedicated to the third Carafa sister, Carolina (b.1829). Chabal was at the Boulevart des Italiens address until c.1846, and thereafter at Boulevart Montmatre. (Paris: chez Chabal, Boulevart Montmatre, 11, n.d. [after 1846]); cover, 4 pages music [2-5], publisher's number "6"
The dedicatee was the young Félicie Fournier (1831-1888), who as Félicie Schneider was later a portrait painter. (Paris: chez Chabal, Boulevart Montmatre, 11, n.d. [after 1846]); cover, 3 pages music [1-3], publisher's number "2"
(Paris: chez Chabal, Boulevart Montmatre, 11, n.d. [after 1846]); cover, 5 pages music [1-5], subtitle on  "(Son souffle qui m'inspire murmure à mon oreille)"; publisher's number "7"
(Paris: chez Chabal, Boulevart Montmatre, 11, n.d. [after 1846]); cover, 5 pages music [1-5], publisher's number "4"
(Paris: chez Chabal, Boulevart Montmatre, 11, n.d. [after 1846]); cover, 2 pages music [2-3], publisher's number "3"
(Paris: chez Chabal, Boulevart Montmatre, 11, n.d. [after 1846]); cover, 4 pages music [2-5], "Tarantelle Napolitaine" [title on 1], publisher's number "1"
The Parisian polka craze began to be widely reported internationally during 1844, and examples of music composed for the dance began to appear in print outside France shortly afterward. This US edition, probably of c.1844-50, appears to be a simplified version from the Pacini edition. Augustus Fiot began to publish music in 1835, first in partnership with Leopold Meignan, and alone from 1839 until 1855 ( https://libwww.freelibrary.org/digital/item/pdcj00060 ). William Dubois began publishing music in New York as early as 1813. He was frequently in partnerships; however, a period spent working under his own name only, from 1844 to 1850 most likely corresponds with this issue (http://antiquepianoshop.com/online-museum/dubois ). ([Naples]: Privilegiato Stabilimento Musicale Partenopeo di T. Cottrau, Str. S. Pieto a Majella, 31, n.d.); wrapper "Polke favorite", 2 pages music [2-3], publisher's number "9070"
"Il Carnevale Napolitano 1853, musica scelta per balli da sala . . . Repertorio edito con privilegio dallo Stabilimento Partenopeo successore di B. Girard e C."
La plainte de l'âme, romance par Charles d'Apice à Madame la duchesse de Bojano, Paris 14 April 1884, offert par l'auteur à l'aimable Mlle. Jeanne de Bojano, C. d'A. (Autograph MS); cover, 3 pages of music, title on  "Paroles de Lamartine" [? doubtful], first line: "Oui je sais votre indifférence . . ."